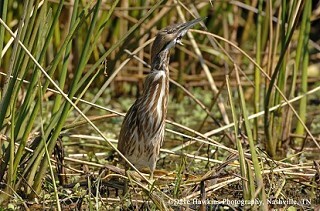 The American Bittern is solitary, cryptically colored, and will wait motionless for long periods while hunting. As a result, this is not an easy heron to see. The American Bittern is primarily found in Tennessee during migration, so its distinctive, deep pumping oonk-kadoonk song is seldom heard here. It breeds in freshwater wetlands across Canada and more sparsely across the northern half of the United States. It winters in wetlands along the southern Atlantic coast where temperatures remain above freezing, the Gulf Coast, and southern California southward into Mexico and the Caribbean. Description: This medium-sized, stocky heron has a thick neck and bill, and is overall warm brown with a bold brown and white streaked neck. In flight, contrasting dark flight feathers are conspicuous. Males and females look alike. 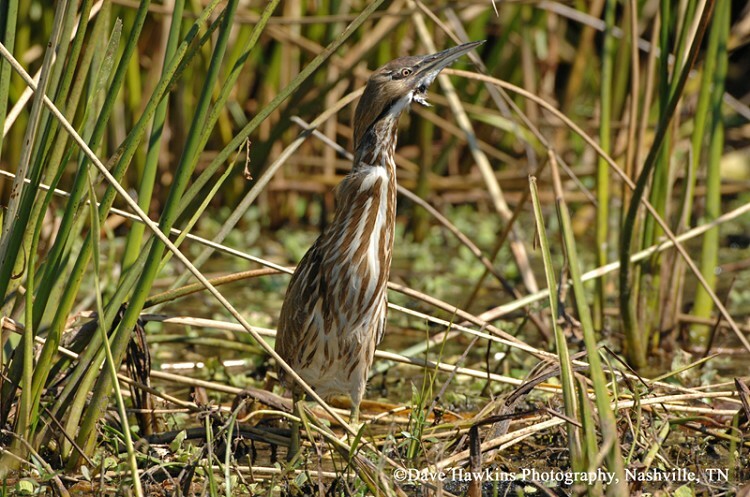 Immature Black-crowned night-herons and Yellow-crowned Night-herons are gray-brown, with blurry or narrow streaking on the neck and chest. Least Bitterns are tiny in comparison, with a black or dark brown back and crown, and large golden patches in the wings are visible in flight. Habitat: Marshes with tall, emergent vegetation such as cattails, bulrushes, and grasses. Diet: Mainly insects, amphibians, crayfish, and small fish and mammals. Nesting and reproduction: Tennessee is south of the normal breeding range of the American Bittern. There have been no confirmed recent nesting attempts. Status in Tennessee: The American Bittern is an uncommon migrant and a very rare summer and winter resident in the state. It is usually encountered during migration in mid-March through May and then again from late September through mid-November. There are scattered nesting records from the southern part of the state but none in recent years. When alarmed, the American Bittern will often freeze with its bill pointed straight up, and sway from side to side as if imitating waving reeds. The oldest known American Bittern was 8 years, 4 months old. Best places to see in Tennessee: Large marshes with tall emergent vegetation across the state. Gibbs, J. P. , S. Melvin, and F. A. Reid. 1992. American Bittern (Botaurus lentiginosus). The Birds of North America, No. 18 (A. Poole, P. Stettenheim, and F. Gill, Eds.). Philadelphia: The Academy of Natural Sciences; Washington, DC: The American Ornithologists Union.